Brittany and Kellie Rushing of Pins and Needles Kits Sewlebrity Soft Pants Stitch-In! Join us for a fun chat about getting outside of the metaphorical (subscription) box! 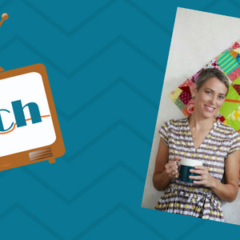 Join us for a lively chat with Deb Luttrell of Stitchin’ Heaven! Learn more about Victoria Findlay Wolfe and her fabulous modern quilt designs and sensibilities. 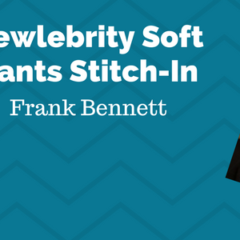 Learn more about the National Quilt Museum from CEO Frank Bennett! 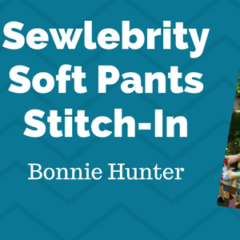 Join Pam and Lynn for a fun chat with Bonnie Hunter of Quiltville! 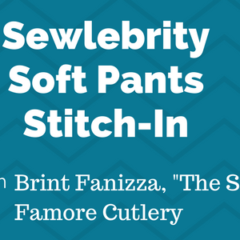 Learn more about The Scissor Man, Brint Fanizza of Famore Cutlery in our latest sewlebrity interview!